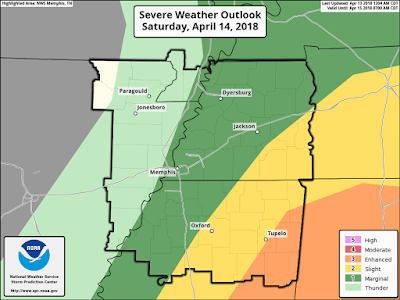 A strong spring cold front is moving towards the Mid-South, but it will take its sweet time, not arriving until Saturday afternoon. However, ahead of that, storms will form to our west later this afternoon and begin a slow march across Arkansas this evening. That is where the Storm Prediction Center has forecast the highest chance of severe weather, including large hail, damaging wind, and a few tornadoes. As the storms move east overnight, they will encounter slightly more stable air, resulting in a general decrease in storm intensity, as well as organization into a squall line. The line will likely affect the metro between midnight and 4am, though a couple of high-resolution models favor a slightly earlier approach closer to 11pm. The good news for those who have evening plans, including the Friday Night Stripes event at the Liberty Bowl, is that the later time should allow those events to wrap up prior to the storm's arrival. However, there is a chance of showers this evening, so I'm not necessarily indicating it will be completely dry until the line hits. 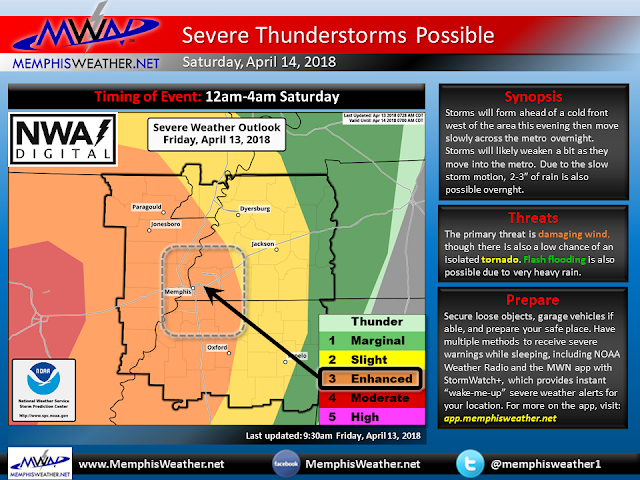 The Memphis area is under an Enhanced Risk (level 3/5) of severe weather tonight, mainly after midnight. Damaging wind and very heavy rain are the primary threats. While all modes of severe weather are possible to our west, where greater instability resides, as the line approaches, the primary threat shifts to the possibility of damaging wind. 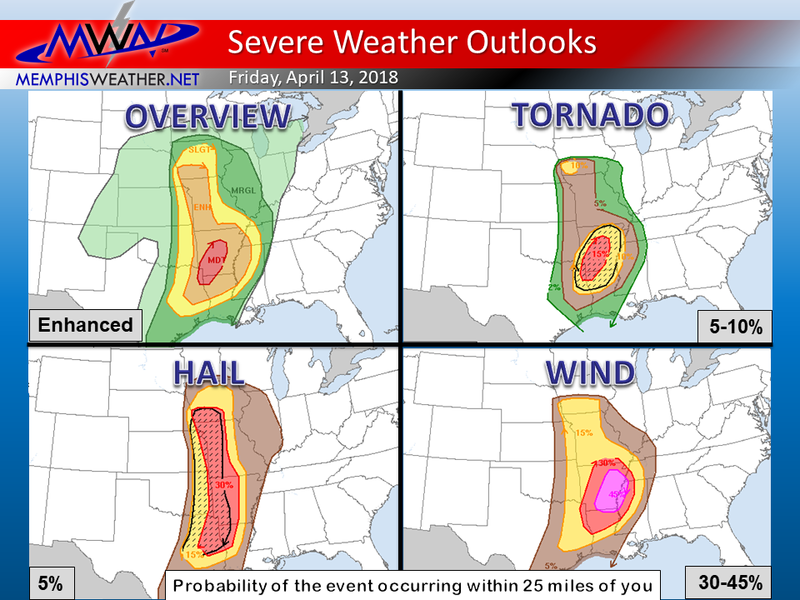 There is also an isolated tornado threat due to the magnitude of the wind with this system, but that threat drops off considerably as the line nears the Mississippi River. Finally, due to the copious amount of moisture in the atmosphere tonight and slow motion of the system, the storms and heavy rain that trails them could produce areas of flash flooding, particularly in the urban setting. Always be cautious of crossing water that covers a road in the dark. Rainfall totals by sunrise Saturday could be near 2-3" with up to an additional inch possible Saturday. A Flash Flood Watch is in effect through 1pm Saturday. Obviously with storms expected overnight, when many of you are already asleep, you need to have some way of getting warnings that will wake you up. NOAA Weather Radio works great and is recommended. We also highly recommend you check out StormWatch+ in the MemphisWeather.net mobile app. For about 1/3 of the cost of a weather radio, you get fully customizable, portable weather alerts that will wake you up only for the most severe storms. 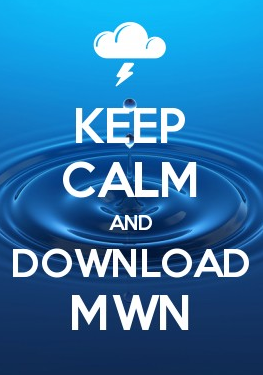 Visit app.memphisweather.net for more on the MWN mobile app, or simply activate StormWatch+ from the SW+ tab in your MWN app! 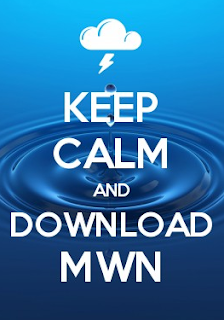 If you have plans to be out tonight, we recommend being where you have access to a safe place by about 11pm. Of course, we'll keep you updated on the latest timing and threats via our social media feeds, which you will find linked below. As for Saturday, because the system is moving so slowly, and the likelihood of a weak low pressure center forming and moving north along the front, there is a good chance of additional rain during the day. Models are somewhat split on the timing for Saturday, but my best educated guess says that lingering rain will occur into the morning, with a lull around mid-day, and then additional shower chances in the mid-to-late afternoon time period. 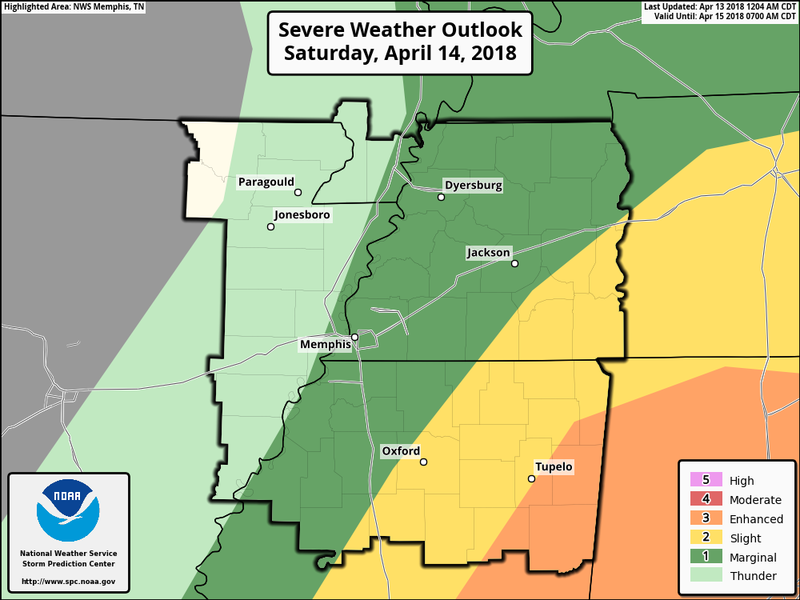 In addition, the atmosphere is expected to destabilize again tomorrow afternoon, mainly east of Memphis, as the front finally moves through. Thus, a thunderstorm can't be completely ruled out, especially east of the city. Dry and much cooler weather arrives on Sunday with clouds likely to linger as well. The dry trend looks to continue for most of next week with quickly moderating temperatures after Monday.